Our goal has always been to let you focus your energy on what makes your app unique. One of the ways we do that is by handling the nitty-gritty details of the various platforms Xojo supports. For example, you don’t have to worry about the differences in how files are accessed on Windows, Linux, macOS or iOS. We take care of that for you. Saying all this is one thing, however, and delivering it is quite another. We’ve been through some significant technological hurdles over the years. Over the past 12 months we’ve had two big transitions. The first was support for HiDPI (called Retina on macOS and iOS) which made it possible for apps created with Xojo to support high definition screens. For Xojo users, adding HiDPI support was mostly a matter of recompiling their app. If they had pictures or icons, higher resolution versions needed to be supplied but aside from that, it was effortless. 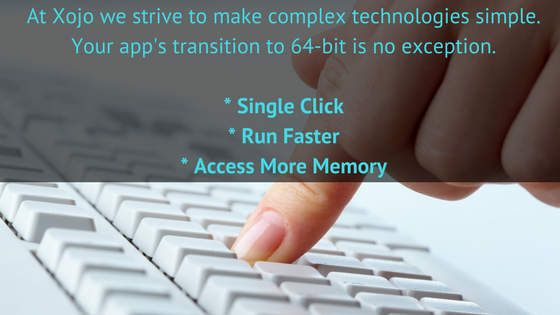 The second big feature we’ve been working on is support for 64-bit. Integers are the issue here and are almost certainly the most common data type used in apps built with Xojo. If you have used the generic Integer type, in theory, building a 64-bit version of your app should be a simple matter of recompiling. That’s the theory. What’s the reality? I wasn’t too sure what to expect from the 64-bit transition, but knowing that Apple are planning to cut off 32-bit support next year made me want to try and move our macOS app over as part of the major update that we’re working on at the moment. I’ve yet to run any benchmarks myself yet, but the 64-bit debug build certainly feels snappy and responsive. Light Blue Software plans to make a 64-bit beta version available to their customers for testing soon. All the work that your team have been putting into making this transition seamless for developers is deeply appreciated! Thanks Tom. We’re just doing our job and we appreciate your continued support.